On July 19 Saratoga PLAN finalized protection of 219.9 acres of productive farmland in the towns of Northumberland and Saratoga, located near the village of Schuylerville, and adjacent to historic Stark’s Knob. The property, owned by Allen D. (Wayne) Wood and Wood Family Trust, is now protected for scenic enjoyment by the public and for agricultural use by a permanent conservation easement that will be forever monitored by Saratoga PLAN. This significant project was supported by Hudson Valley Agricultural Enhancement funding from the New York State Department of Agriculture and Markets. Saratoga PLAN managed the grant funding and the transaction, and performed all necessary legal steps to secure the transaction. The terms of the agreement will be monitored, upheld, and documented by PLAN. Maria Trabka, Saratoga PLAN’s executive director, said, “Through this conservation easement project, Wayne and his family demonstrated their steadfast commitment to honoring the agricultural heritage of their family and of the Bacon Hill community. 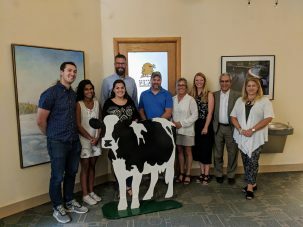 Their wish to ensure that 220 acres of their farm continues to feed future generations was made possible by funding from New York State, recognizing the importance of both agriculture and open space in Saratoga County. PLAN looks forward to helping other families conserve important properties throughout Saratoga County.” She added that Saratoga PLAN is currently working on 11 more farmland conservation projects in the county, as well as numerous trail and habitat projects. Wildwood Farms is located in an important agricultural district that includes several dairy farms, and the property currently raises a large herd of heifers for an area dairy farm, as well as fields of corn, hay, and straw. Wildwood Farms supplies12,000 bales of straw to the racetrack in Saratoga Springs, and another 1,400 bales to local thoroughbred horse farms. Stark’s Knob, adjacent to the property, played a significant role in U.S. history. The basaltic outcrop served as a lookout and gun station during the 1777 battles of the Revolutionary War, and many artifacts have been found in nearby farm fields. Historic maps depict Colonel Morgan and his American “sharp shooter” riflemen with a defensive line in the area.